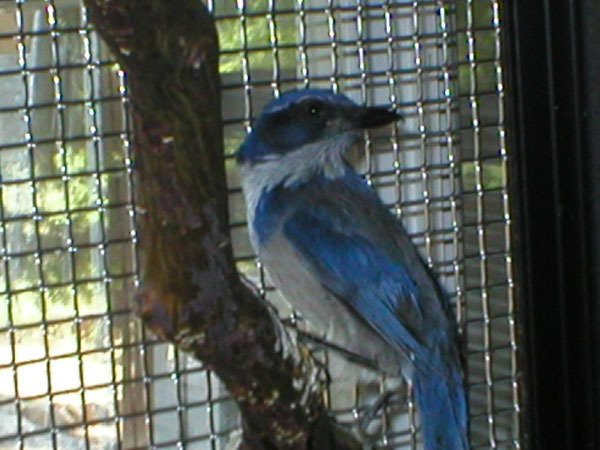 “Leno” is a Scrub Jay that fell from a nest, late in the Summer of 2007. If his finder had put him back in the nest or in a box up high, safe from cats and dogs, his parents would have continued to raise him and he would be out in the wild. They raised him for several days, however, before calling Badger Run Wildlife Rehab, so he believes all humans are “food givers” and he is very imprinted, preferring human company to that of other birds. A member of the Corvid family, (Jays, Ravens, Crows, etc. ), he is extremely smart and knows that doing education presentations means that he gets some of his favorite treats to eat, so he is always eager to go show off! UPDATE: Leno has been released! After 2 years of therapy and retraining, he was able to cope with life in the wild!